On Friday 9th November, Staffordshire County Federation of Young Farmers Clubs (YFC) held their County AGM in the Ingestre Suite, County Showground, Stafford. The evening was kindly supported by Pickering and Butters Solicitors, a firm of Staffordshire Solicitors who were founded over a century ago, with offices based in Stafford and Rugeley. 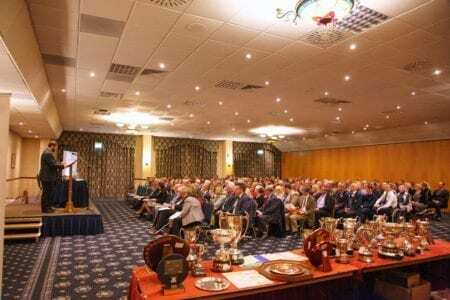 The County AGM was attended by over 250 invited guests and members of the Federation and is the most prestigious meeting of the Staffordshire YFC year. Richard Mottershead, gave his County Chairman’s report on last year of activities. Richard, a member of Ashley Young Farmers said “It has been an absolute honour to have been the Staffordshire YFC County Chairman over the past twelve months. I don’t think I’ve paused or had a night off since being elected but I have loved every minute of it. Even before I began my year, I knew I had two things I wanted to achieve. The first was to hold a large charity campaign that involved the whole county; the second was simply to enjoy the year, getting along with as many members as possible in as many clubs as possible. Standing here now, I would like to thank each and every one of you for both getting behind the Oatcake on Tour campaign for Young Minds, and for making me feel so welcome at everything I was able to attend. Because of that, I am thrilled to say, I achieved my aims, and I couldn’t be prouder of the year we have had together.” During Richard’s reported, he presented a cheque for £307 to The Farming Community Network following monies raised during the recently held Harvest Festival Service and then went on to announce that the final total raised for Young Minds from the Oatcake on Tour was £7120. It was reported during the meeting that Staffordshire YFC has 680 members aged 10 – 26 years. The members have benefited from taking part in some amazing charity work and playing an active part in their local communities. From Eccleshall YFC raising over £11,000 for the Dan Moseley Rehabilitation Fund to Leek YFC walking 26 miles in 28-degree heat raising money for ‘Young Minds’. These are just two examples of the many ways in which the eleven clubs in Staffordshire, all of whom are charities themselves, take time and plan events in order to raise funds for other charities across the Country. In total this year, the Clubs in Staffordshire have raised over £34,000 for worthwhile causes. Manifold Marketing Award: Awarded to the Club who best promotes their Club and engagement in Club, County & Community Events. Scrapbook Award: Awarded to the Club who produces the most interesting and unique scrapbook based on the activities of their own Club over the past membership year. Small Clubs Trophy: Awarded to one of the five smallest Clubs in the County with regard to membership, that has achieved the most points throughout the year for competitions. Mr Ken Unwin MBE Memorial Cup: Awarded to the Club who most improves in Public Speaking, Stock Judging, Carcase Judging and Tug of War. W.H.D. Hobson Cup: Awarded to the Club with the highest increase in membership. YFA Travel Award – Amy Nicholls of Ashley YFC, for her report and presentation following her visit to Budapest. Oxford Farming Conference: The Staffordshire & Birmingham Agricultural Society kindly sponsor two places for the Conference held in January 2019, and following applications made by members, describing in no more than 500 words, why they should be chosen to attend. The two members awarded the places were: Annie Bradshaw of Eccleshall YFC and Robert Mollatt of Uttoxeter JNFU. Junior Stockjudging Cup: The joint winners were Leek YFC & Lichfield YFC and the runners-up were Uttoxeter JNFU. Intermediate Stockjudging Cup: The winners were Uttoxeter JNFU and runner-up was Waterhouses YFC. Senior Stockjudging Cup: The winner was Uttoxeter JNFU and the runner-up was Eccleshall YFC. Overall Stockjudging Cup: The winner was Uttoxeter JNFU and the runner-up was Lichfield YFC. As can be seen from the above young people between the ages of 10 and 26, experience fun and excitement, whilst enjoying competitions, discos, sports, travel, meeting new friends and learning new and different skills. If you are interested in joining them please contact Julia Taylor, County Organiser on 01785 248645 or email countyoffice@staffsyoungfarmers.org.uk for more information and details of your nearest Club.